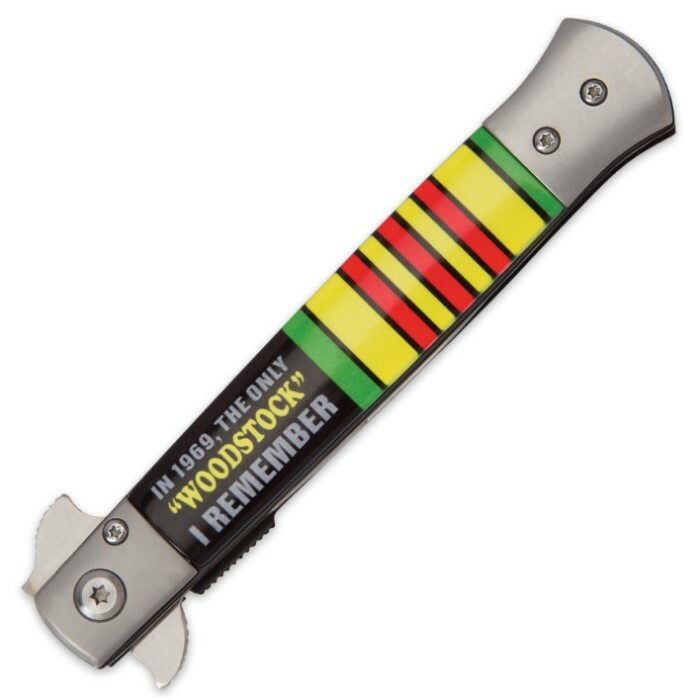 The Only 'Woodstock' I Remember... Vietnam Veteran Assisted Opening Stiletto Knife | BUDK.com - Knives & Swords At The Lowest Prices! Where were you in 1969? Frolicking about, care-free, in the mud at the Woodstock '69 Music and Arts Festival? Or fighting for those festival-going hippies' freedom in an equally muddy, but decidedly less cheerful setting - the brutal, soggy jungles of Vietnam? 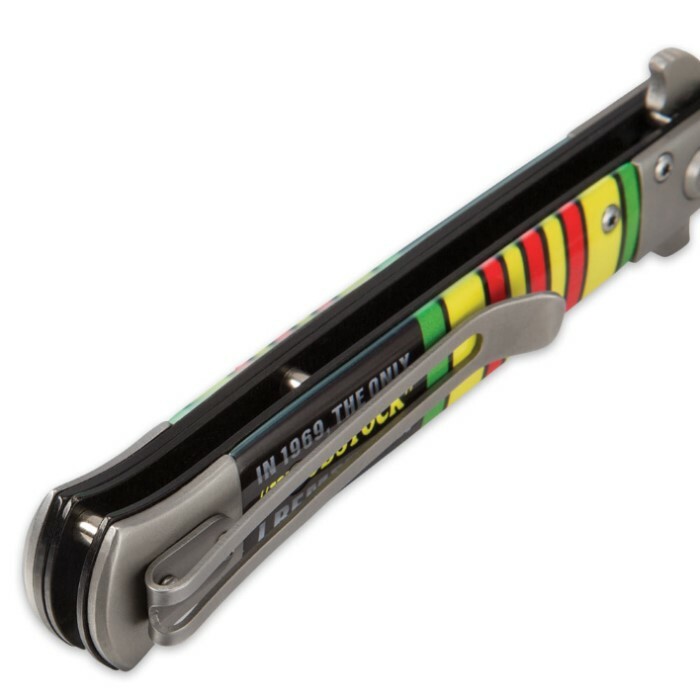 Vietnam vets, tell everyone where you were in the summer of love with this amusing yet poignant assisted opening stiletto knife! "In 1969, the only 'Woodstock' I remember...," the brilliant, full color handle reads, cleverly referring to the wooden stocks of Vietnam-era military rifles. The text is emblazoned beside a stately representation of the iconic Vietnam War service ribbon, with its vibrant green, yellow, red and black bands. Striking beauty and superb design doesn't stop at the handle, however. Accented with fine laser etchings and distinctive through-holes, the keen 3 7/8" spear point blade is truly breathtaking, all its own. "Proud American," "Vietnam Veteran," and the silhouette of a Vietnam-era tactical rifle are delicately laser etched into the blade's tough, corrosion resistant stainless steel. The center fuller - with its chic through-holes and elegantly simple form - beautifully complements the blade's sleek lines and stylish curves. But make no mistake - there's plenty of "beast" behind this "beauty," as well! The blade edge is carefully honed to razor sharp, and it deploys with incredible speed and precision, thanks to the advanced assisted opening mechanism. Once opened, the handy liner lock keeps the blade fixed securely in place for added safety and stability during demanding tasks. At 4 7/8" closed, this versatile stiletto is ideally sized for everyday cutting jobs and fits comfortably in jeans pockets, especially with the convenient integrated pocket clip. Its impeccable style and allure makes it equally well suited to display - on its own or in a fine knife collection. Don't forget friends and family! 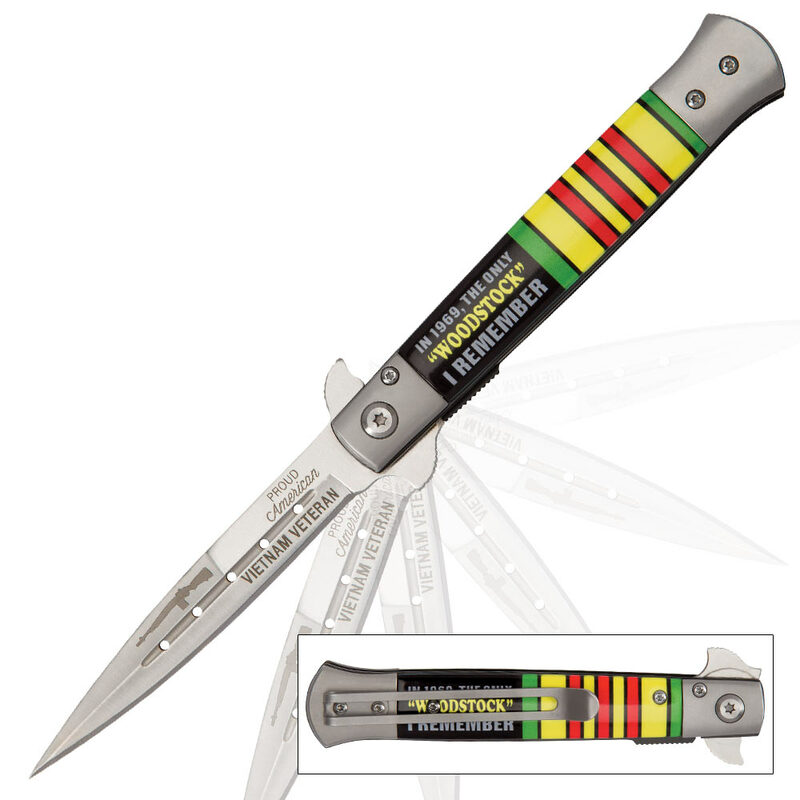 This unique assisted opening folder makes a heartfelt, memorable gift and a charming, lasting tribute for the Vietnam vet in your life! I purchased this Stiletto on BOGO for my collection and I have no complaints. Both blades are razor sharp and no problems with the opening. I would like to see a WW2 and Texas Stiletto! Keep em coming BudK!